70-80% of all mobile downloads are games, with analysts projecting the industry to hit $54 billion by 2015. Mobile game developers captured $87 million in ad revenue in 2010, and that’s expected to grow tenfold in the next four years. We looked at the top gaming apps right now for the iPhone, and were curious how their popularity translated into Likes and interests on Facebook. Angry Birds has well over twice the number of people interested in it than the next popular mobile game, Crime City by Funzio. Crime City is also a Facebook app, which may explain why the game has so many more fans on Facebook than the next three most popular mobile games on Facebook: World War by Storm8, Fruit Ninja by Halfbrick Studios and Smurfs’ Village by Beeline Interactive. World War and Crime City resonate much more with males than females. In contrast, Smurfs’ Village skews female. 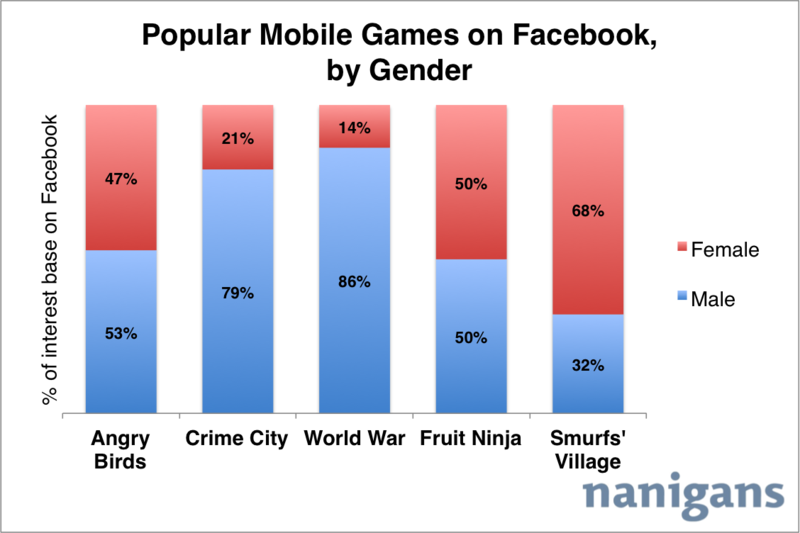 Both Angry Birds and Fruit Ninja, on the other hand, are gender neutral with an equal number of male and female fans. 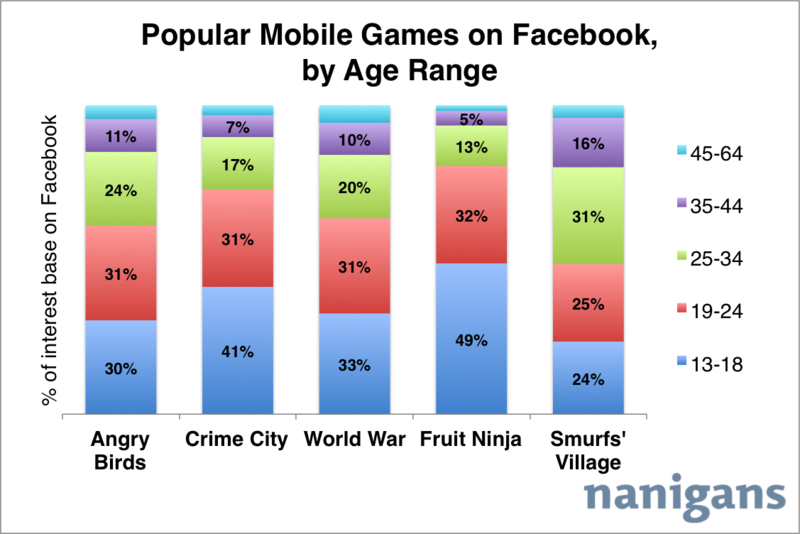 As you might guess, the majority of fans of these mobile games are younger, with over half of their fan bases on Facebook under the age of 25. 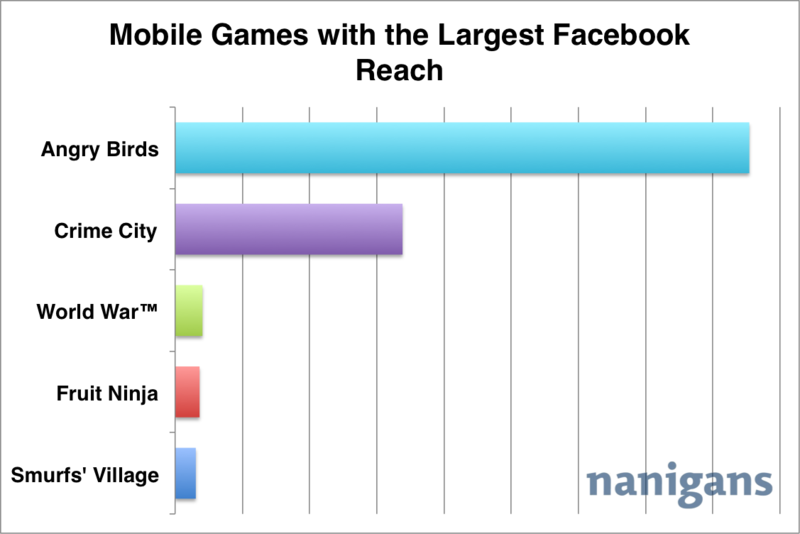 Fruit Ninja appeals to the youngest audience, with nearly 50% of its fan base between the ages of 13-18. Smurfs’ Village has the lowest portion of 13-18 year olds and the highest fraction of 25-34 year olds and 35-44 year olds touting their love for the game on Facebook. With over 2.6% of their state’s population being fans of the game on Facebook, Hawaii, Arizona, Delaware, Nevada and Maryland are most obsessed with Angry Birds. 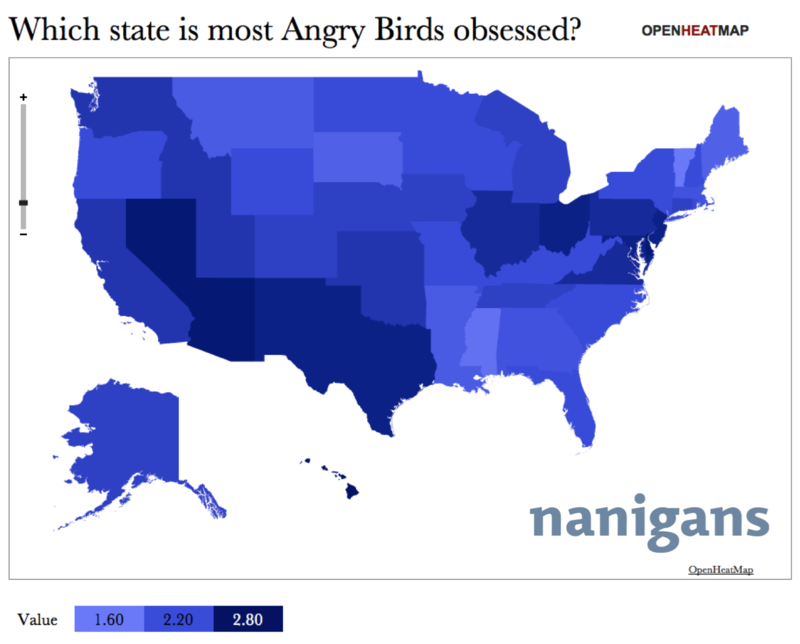 States least obsessed with Angry Birds, with less than 2% of their population interested in the game on Facebook: Vermont, Mississippi, Maine, South Dakota and Montana.